If you’re managing a multilingual site with WPML, we have something for you. Just over a month ago, the wonderful people over at WPML finalised their work on an integration that makes it a lot easier to translate a single sign-up form into different languages. 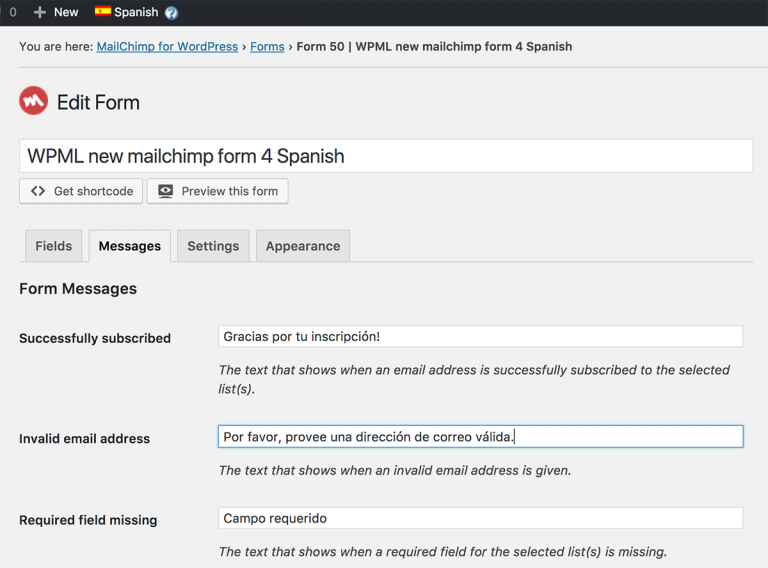 After activating the “Mailchimp for WordPress Multilingual” plugin, you can now translate our Mailchimp for WordPress forms. After the initial translation, you can easily switch between languages using their language switcher in the admin bar while editing a form using our default interface. For more information on WPML’s new plugin, have a look at their documentation for Mailchimp for WordPress Multilingual. Do I need this if I use Mailchimp for WordPress Premium? With our Premium plugin you can already create as many forms as you like. Our recommendation for you remains to create a separate form for each site language and then reference the translated forms in your pages, posts and form widgets.